Nidec Minster Corp., Minster, OH, introduces its MMC lineup of mechanical stamping presses to markets in North and South America. The machines will be manufactured by Ningbo CFG Machinery Co., Ningbo, China. 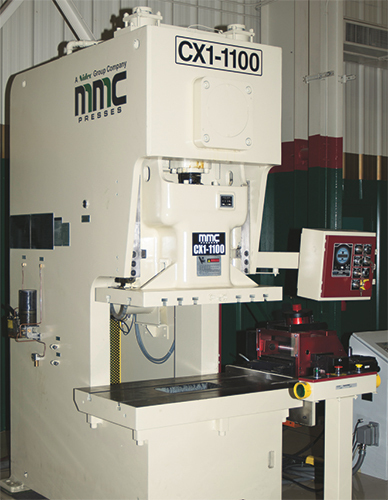 MMC presses are available as single- and two-point gap- and unitized-frame straightsides, and a full complement of tie-rod construction straightside machines with crankshaft or eccentric-geared drives in two- or four-point configurations to 1200-ton capacity. All machines meet or exceed JIS Class 1 accuracy standards, and are equipped with a variety of features to help improve productivity, including wet clutch and brake (most models), hydraulic overload protection, monitored automatic lubrication and Wintriss-brand controls as standard. In addition, many straightside models feature double-geared drives for high torque and working energy, and full eight-point gibbing for maximum tooling life and improved part quality.